I first talked about acrylic dimensional Writer by Americana back when I was building my first Austrian artillery piece. It is essentially a thick paint that adds some dimension to your work, as advertised. However, the product had issues when you tried to build up a sizable area, such as the combs on my Austrian Dragoons. It took lots of layers – with an appropriate drying period in between each layer – and could only go so far before it became fragile. It is only thick paint, after all. So I limited my usage for cap peaks and such and left it at that. While wandering through the local Hobby Lobby I noticed the following product, E6000 Allure Dimensional Design Adhesive Paint. It comes in a 2 ounce tube, in various colors, and either gloss, glitter or metallic. So far I have only purchased Gloss Chocolate and Gloss White. My first test was to see how different it is from Americana Writer and to see whether it kept its gloss. 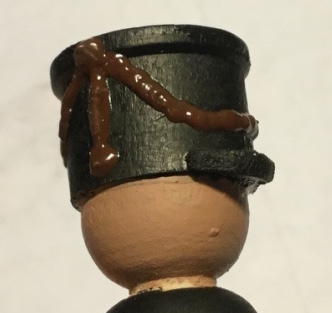 I decided to make a shako cord for one of my 42mm cavalrymen. The first thing you will notice is that it is like a glossy plastic. (This is after it has fully cured.) Second is that it comes out like thick pudding. It is not easy to get a solid, consistent bead. It sort of comes out in waves, giving that rippled appearance. As I get used to it more, I am sure I will get more control over it. Here you can see it being used on a 12mm figure. In this case I have used it over the Americana Writer, which has sort of pooled and flattened out, giving a much crisper, well-defined shako peak. Further, I have created the cockade at the top and the whole of the right arm of the figure. 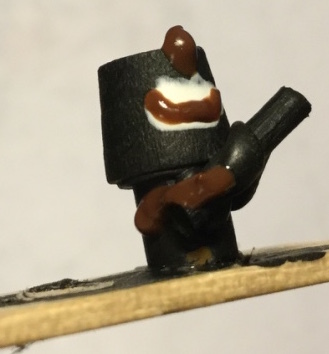 You have much more control of the material than with hot glue. The material takes a bit to set up, about 15 minutes or so, and takes several hours to cure. It still stays a bit tacky for a day, but I see no deformation. It is adhesive, and I see no signs of this peeling off, at least from wood (which is very porous), so your ability to manipulate it after curing will be limited to cutting with a sharp blade. Because of its rubbery nature, sanding is problematic. It is like trying to sand latex or silicone caulk, rather than plastic. To get an idea of the thickness and control you can get, I decided to try the various products on wood. The picture above is cropped, but to get an idea of the size, the above is as wide as a wooden popsicle stick. Item A is Americana Writer. You can see after curing overnight that it has flattened out a bit and pooled. Item B, D and E are White Gloss Allure mixed with Americana Light Avocado craft paint (about 60%-40%). B sort of spurted out. D shows a thicker layer for dimension. E shows a thinner layer to see if the gloss is reduced and to show fine control. I mixed this with my grass green color as I wanted to see if this could be a substitute for static grass for 6mm figures, as I previously experimented with on my other blog. It looks like it can. 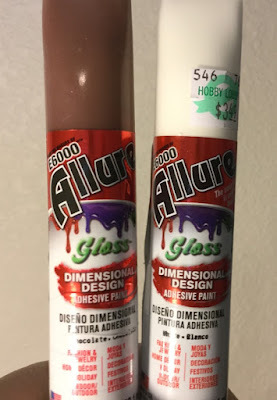 Item C is straight Chocolate Gloss Allure. Notice the waves and high gloss. It is much thicker and can definitely be used to make larger and taller dimensions for details. This product is highly recommended for quickly and easily adding those details onto your figures where you need more dimension. It has the ability to easily form points and it retains much of its shape during curing with very little shrinkage, flattening or pooling. I have noted, however, that the larger the area where you put this product, the more likely it will flatten. This is great for making dots and lines, but less so for adding large, well-defined shapes. That is so useful for the head wear on the 19th century figures. What a quick, easy, and effective way of doing that! Cold Weather = More Painting! 2 New Heroes and a New Tile?